As many of you know that his site is growing . I have 5 other website to handle. So with that being said if you or someone you know is willing to send in news or find news for the site . you will get credit for it . just email it to me . any news that was send in would be appreciate. Thank you for your time & support of the site. Three individuals - including a former top aide to Gov. Scott Walker - were charged Thursday with felonies as part of the ongoing John Doe investigation into Walker staffers. Tim Russell, a longtime Walker campaign and county staffer, was charged with two felonies and one misdemeanor count of embezzlement. 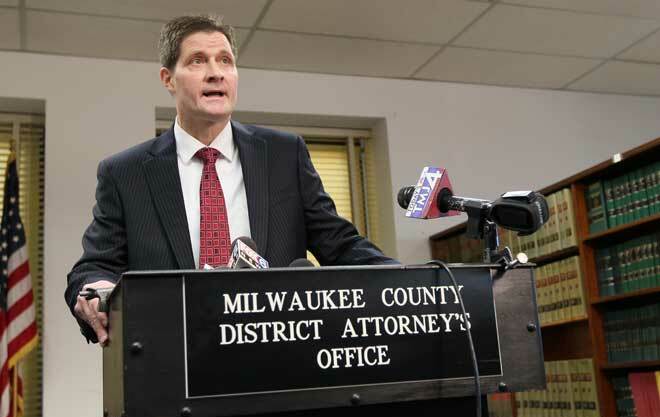 Milwaukee County District Attorney John Chisholm said the charges are tied to Operation Freedom, an annual military appreciation day held at the Milwaukee County Zoo. The complaint says that Russell diverted to his personal bank account more than $21,000 intended for Operation Freedom, using some of those dollars to go on Hawaiian and Caribbean vacations with his domestic partner. Other funds were used, the complaint says, for Russell to attend a weekend political strategy session in December 2010 with Herman Cain and his chief of staff, Mark Block, to discuss Cain's now-defunct presidential campaign. Chisholm said some of the stolen money was intended for the families of Wisconsin soldiers who were killed in action in Iraq and Afghanistan. Funds also were used for wounded veterans of the war in Iraq. In 2010, Walker's county administration had asked prosecutors to investigate what had happened to $11,000 raised in 2007 for the event. Chisholm said at a press conference that he could not take questions because of the ongoing investigation. He noted that Walker's administration had asked for the investigation and said his office was following the evidence without regard to politics. "We go where the evidence leads and partisan politics plays no role in any decision by this office," Chisholm said. Russell's attorney, Michael Maistelman, had no comment. In a terse eight-minute conference call Thursday with reporters, Walker took four questions after making a statement that it was his office that had been responsible for bringing the theft to light and appreciated the efforts of Chisholm's office. He said he was "very disappointed" about the alleged theft but said he didn't believe the charges would affect an ongoing attempt to gather 540,000 signatures to force a recall election against him. "In terms of the recall, obviously anyone can try and twist things but I in the end think people will realize it was my office at the time that brought this to the attention of the district attorney's office," Walker said. Also charged Thursday was Brian Pierick, Russell's longtime partner and a staffer at the state Department of Public Instruction, and Kevin Kavanaugh, Walker's appointee to the Milwaukee County Veteran Service Commission. Kavanaugh, 61, of Cudahy, is charged with five felonies for theft and fraudulent writings by a corporate officer. He was the treasurer of the Milwaukee Purple Heart chapter at the time of the dispute over the $11,000 for Operation Freedom. Prosecutors say he stole more than $42,000 in donations intended to families of U.S. service members killed or wounded in Iraq. Russell appeared in court Thursday afternoon, wearing handcuffs and dressed in a t-shirt and jeans. He was released on a $20,000 signature bond. Russell pleaded not guilty to a single misdemeanor embezzlement count, for taking $550 from the campaign fund of a County Board candidate, Larry Spicer. A preliminary hearing on Russell's two felony embezzlement charges was set for Jan. 23. Kavanaugh was also released on a $20,000 signature bond on his five felony counts related to plundering the Purple Heart funds. Kavanaugh embezzled money given to the Military Order of the Purple Heart , according to the complaint. Kavanaugh was finance officer for the organization's Milwaukee-area chapter, named for the late war veteran Michelle Witmer. The bulk of the Purple Heart money Kavanaugh took came from money raised for "Operation Freedom," an annual event for veterans sponsored by Walker during his stint as county executive and held at the Milwaukee County Zoo, according to a criminal complaint. The donations for the event were obtained by Russell on behalf of Walker from local businesses. He also siphoned Purple Heart money that came from three different sources: former state Rep. Mark Gundrum (R-New Berlin), a grant from the Rolfs Family Foundation and the Purple Heart's own foundation. Gundrum, now a state appeals court justice, donated more than $28,000 of his legislative salary to the Purple Heart while he was on active duty in Iraq in 2008; Kavanaugh peeled off $4,800 of that amount. That year, Gundrum's wife nine wrote checks to the Military Order of the Purple Heart Relief Fund. While transferring those funds to the Purple Heart general fund, Kavanaugh got $300 to $800 cash back each time, according to the complaint. "My wife and I are just saddened that at least a portion of the money we donated to aid veterans wounded in war appears as if it may never have been used for that purpose," said Gundrum. In a 2010 interview with the Journal Sentinel, Kavanaugh said he was unaware that there was any concern by prosecutors over some $11,000 in Operation Freedom believed missing at the time. He attributed bookkeeping problems to a shortage of help at the local Purple Heart chapter. "I don't really know what they are talking about," he said, when asked about the concern over missing money. In a brief interview, Bob Bruhns said he was the organizer of a new local chapter of the Military Order of the Purple Heart. But he cut short the interview without commenting on Kavanaugh, saying he and all the other leaders of the organization were under orders from the court and the district attorney not to speak of the matter. "I have a gag order," Bruhns said. A December 2010 story in the Milwaukee Journal Sentinel detailed Kavanaugh's tradition of placing wreaths on the graves of soldiers who died serving in Iraq. That story said that Kavanaugh earned a Purple Heart when he was hit by shrapnel from a booby trap in November 1970 while serving in the Army west of Chu Lai, Vietnam. In the complaints, the Alonzo Cudworth American Legion Post 23 was listed as handling the veterans funds correctly before the responsibility was handed over to Russell and the Heritage Guard Preservation Society in October 2009 - a decision personally signed off on by Walker as county executive. Mike Herkowski, adjutant for the post, said that his group did bookkeeping and disbursing of the money but not fundraising. He said he was in "total shock" over the allegations of theft from needy veterans and their families. "Anybody that would stoop that low to do something like that, I'm totally amazed," Herkowski said. Herkowski said that he was surprised when he was informed by Milwaukee County officials that his group would no longer be handling the money and it would be handed over to Heritage Guard. He said he had turned over all his information on the matter to investigators and answered questions from them. He said that he was told by Milwaukee County officials that the responsibility for the money was being taken away from the American Legion because it has an unusual non-profit status that was difficult to explain to corporate donors. Milwaukee County wanted a more typical 501(c)3 type non-profit to make it easy to understand the donations were tax-exempt so fundraising would be easier, Herkowski said he was told. "They said it would be easier to get the money," he said. Ironically, Herkowski pointed out, the criminal complaint alleges that the Heritage Guard group may not have had a valid 501(c)3 status. "Somebody just pulled the wool over somebody's eyes, Herkowski said. Walker said Thursday that the decision to transfer the funds from the American Legion to Russell's group had been made to safeguard the money. "The focus was instead of moving around from one group to another it's probably best to have one group that just did this so the funds couldn't be comingled with anything else," Walker said. Pierick, 48, was charged with two felony counts for child enticement. He is an office operations assistant for education for homeless youth at DPI dealing with education for homeless children and youth, according to the agency's website. Patrick Gasper, a spokesman for the Department of Public Instruction, said Pierick was being let go from his job Thursday at the decision of agency human resources and state schools superintendent Tony Evers. Pierick was essentially a secretary and made $13.96 an hour, which would work out to about $29,000 a year. He started in October 2011 at the civil service job and was still in his six-month probationary period and so could be fired for any reason, Gasper said. "We're drafting the letter right now," Gasper said. Gasper said Pierick had no contact with children as part of his office job and underwent and passed a background check at the time of the hire. He said to his knowledge Walker's office played no role in getting Pierick the job, which was not a political appointment. Walker spokesman Chris Schrimpf also said the job was not an appointment. Schrimpf had no immediate comment on the news of the arrests but said the office would provide one later in the day. "We're still looking at it," he said. Russell, who was housing director for Walker at the county, is facing Class G and Class I felonies. A Class G felony carries a fine of up to $25,000 and up to 10 years in prison or both. A Class I felony carries a fine of up to $10,000 and up to three and a half years in prison or both. In August 2010, authorities seized Russell's county computer just weeks before the gubernatorial primary. A longtime political hand, Russell, 48, used to run former Gov. Tommy Thompson's Milwaukee office and had been with Walker since he ran for county executive in 2002. Russell did not get a job in the Walker administration in Madison. Last year, Russell and Pierick had their Milwaukee residence foreclosed on, and the pair moved to the Madison suburb of Sun Prairie. Chisholm's office has been overseeing the investigation for more than 1 1/2 years. Walker set up the annual Operation Freedom as a military appreciation day at the zoo for veterans, who got free admission and food. It was run through the county executive's office. Russell was the coordinator of the event and worked on it with Darlene Wink, another former Walker aide at the county who has been under investigation in the John Doe probe. The Journal Sentinel reported in June 2010 that the district attorney's office was investigating the finances of Operation Freedom after Walker's office alleged an $11,000 shortfall in a dispute with the local chapter of the Military Order of the Purple Heart. The Purple Heart had acted as fiscal agent for the program in 2006, '07 and '08. Later, in 2010, the financial end of the event was transferred to an entity known as the Heritage Guard Preservation Society, Russell told the newspaper in 2010. In 2009, an American Legion Post handled those duties. The Heritage Guard Preservation Society was incorporated for a different purpose as a nonprofit in 2004. But Russell said in 2010 that the dormant firm was shifted to Operation Freedom. The financing setup for the event drew ethics scrutiny in 2006, when two county Ethics Board members questioned the practice of county officials asking private companies for money for public programs, saying it raised conflict-of-interest questions. Walker said then that he was trying to save taxpayer dollars and that he'd resolve ethics concerns by asking a veterans organization to solicit funds for the event. Walker got legal advice that the fundraising should be handled by a separate charitable entity. In 2010, an official with the Milwaukee Purple Heart chapter said he thought the dispute over the $11,000 was resolved when the chapter paid $10,000 to the zoo for 2007. Russell said even with the zoo payment, there was still an $11,000 shortfall from 2007 receipts. "Nobody's making accusations about anything here," Russell said then. Bookkeeping errors could ultimately explain the shortfall, he said. Wink quit her job as Walker's constituent relations director in 2010 after she acknowledged posting political comments on the Journal Sentinel website while at work. She monitored the finances for the program in 2007, but did not collect checks or pay the bills, Russell said. That was Purple Heart's job. In a May 26, 2010 posting on his county website, Walker said Operation Freedom was a way to thank military personnel and families. "The picnic, patriotic program and Supermarket of Veterans Benefits are a small way for us to show our appreciation and give back for all our military has done for us," Walker wrote. Operation Freedom includes free admission to the zoo, as well as free food and entertainment. Veterans' organizations also are on hand. This year's program will include a military honor guard and Air Force flyover.